Brian Cody’s side prevailed despite being without Henry Shefflin for the game. 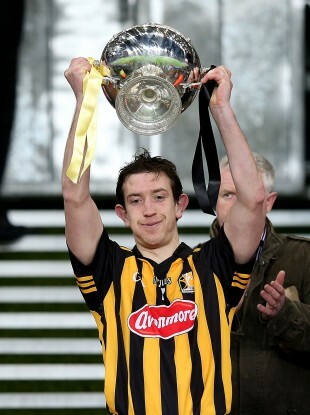 Kilkenny's David Langton lifts the cup. EOIN LARKIN HIT 0-11 as Kilkenny withstood a second-half fightback from Dublin to win tonight’s Walsh Cup final at Croke Park. Brian Cody’s side, who were without Henry Shefflin in their 24-man squad, started strongly on their trip to the capital and were 0-8 to 0-3 clear by the 21st minute. Larkin, Joe Brennan, Padraig Walsh and Thomas Breen all chipped in with points for Kilkenny during that time frame. Dublin stayed in touch, largely due to the excellence of Mark Schutte, in attack. His 28th minute point, one of six he struck during the game, cut the gap to 0-8 to 0-6 and Dublin could have been in front but for Paul Ryan’s goalbound effort being stopped by David Herity. Kilkenny regained control before half-time to lead 0-12 to 0-8 at the midway mark and were 0-15 to 0-8 clear by the 40th minute. Then Dublin got a lifeline when Paul Ryan buried a 20-yard free in the 40th minute to leave Anthony Daly’s side trailing by 0-15 to 1-10. Again Kilkenny took over with Larkin and Colin Fennelly spearheading the scoring drive to see them lead by 0-22 to 1-12 with 13 minutes left. But Dublin strung together five points without reply and excitement was mounting amongst the home supporters as they trailed by two points with three minutes left. Scorers for Kilkenny: Eoin Larkin 0-11 (0-9f, 0-1 ’65), Colin Fennelly 0-4, Joe Brennan 0-3, Thomas Breen, Aidan Fogarty 0-2 each, Mark Kelly 0-1. Scorers for Dublin: Paul Ryan 1-4 (1-3f), Mark Schutte 0-6, David O’Callaghan 0-2, Joey Boland (0-1 ’65), Eamon Dillon (0-1f), Danny Sutcliffe, Martin Quilty, Alan Nolan (0-1f) 0-1 each. KILKENNY: David Herity; Tomas Keogh, Michael Walsh, Jackie Tyrrell; Brian Kennedy, Tommy Walsh, David Langton; Conor Fogarty, Padraig Walsh; Joe Brennan, Colin Fennelly, Eoin Larkin; John Jo Farrell, Mark Kelly, Thomas Breen. Subs: Aidan Fogarty for Padraig Walsh (48), Paul Murphy for Langton (56), Liam Ryan for Breen (67). DUBLIN: Alan Nolan; Cian O’Callaghan, Peter Kelly, Jack Dougan; Stephen Hiney, Conor McCormack, Joseph Boland; Shane Durkin, John McCaffrey; Conal Keaney, Ryan O’Dwyer, Colm Cronin; Paul Ryan, David O’Callaghan, Mark Schutte. Email “Larkin inspires Kilkenny to Walsh Cup final victory over Dublin”. Feedback on “Larkin inspires Kilkenny to Walsh Cup final victory over Dublin”.